I did a search but only found reference to the Yamaha MD-BT01, has anyone used the UD-BT01with an MOXF or similar model. If so any comments as to how well it works with IOS apps, e,g, Garage Band, ease of setting up. I actually didn’t see the video. I was thinking, if the UD-BT01 connects via a USB-B (USB TO HOST port), as it shows, the MOXF keyboards have one. It should work with it fine, as midi is midi. 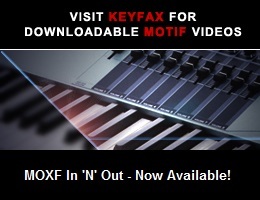 The Motif XF also has a port, as do many other Yamaha keyboards. You SHOULD be able to just connect the UD-BT01 to the USB To Host port on a keyboard, and then it should work fine. You profile does not indicate any specific keyboard, so I can only tell you the technical information. I have MD-BT01 and it works really fine. Just have to set your instrument to MIDI and turn off. Plug BT, than turn on and start app that supports this device. I have only noticed when using with Rack XS that I could not use USB keyboard connected to iPad since after that I could not control Rack. Immediately after unplugging USB keyboard, I could select voices from VoiceEditor, for instance. But, there is one really feature. MD-BT works with every (yes every!) Yamaha device that I have, not just those mentioned in compatibility list. I have checked with Motif ES and even with MU2000EX and it works without issues!!!! Can we use MD-BT to receive MIDI signal from IPAD? Yes it works fine. I use the MOXF8 an IPAD Air2 and the App Setlistmaker to change the performances, Voices etc..... Works perfectly!